No matter if you are walking, biking, driving or using public transport. It is very easy to reach Øksnehallen. Copenhagen Central Station is about 100 meters away, and you’ll find parking for your bicycle in the area nearby. If you arrive by car there are many parking options close, and also parking garages. The Øresund Train (Öresundståget) can take you to and from Malmø, Kristianstad, Karlskrona, Växjö og Kalmar, and many other cities in the south of Sweden and all along the Swedish coastline to Helsingborg and Göteborg. These trains arrive and depart with great frequency. You can use Rejseplanen below, if you need to plan your trip to the Copenhagen Bike Show. External link in Danish only. Visitors from Malmö – and Sweden in general – can easily get to the show with Skånetrafiken, who operate direct trains to Copenhagen Central Station only 3 minutes walk from Øksnehallen. External link in Swedish only. 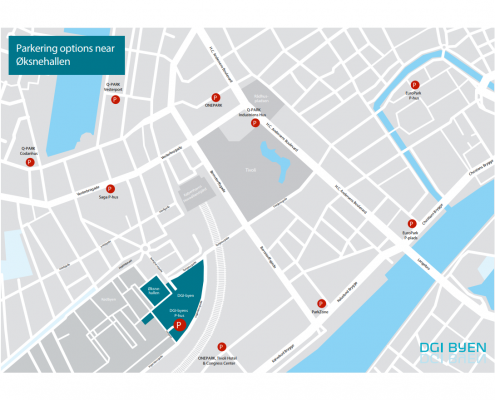 Find a parking space close to the show using the overview below.